La recette des pâtes selon notre Divine Garbo ? La voici, traduite… en anglais ! 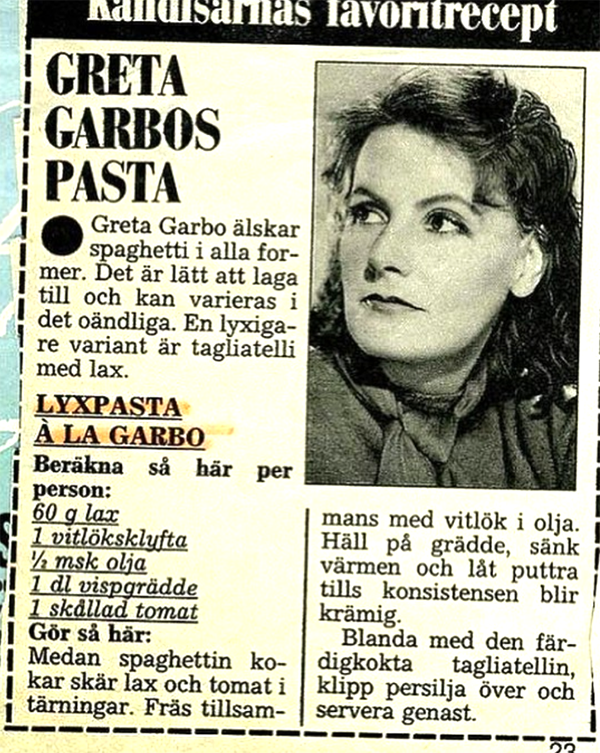 Pasta, enough for four servings, preferably a thick toothy kind, like linguine, tagliatelle, pappardelle, or fettucine. Blanch the tomatoes in boiling water for a few seconds until skins split. Set aside and cool to touch, and then peel off the skins. Cut up salmon and tomatoes, and mince garlic. Start with one clove, add more if desired… Heat the oil in a skillet or sauce pan at medium, and then stir in tomatoes, garlic and salmon. Stir over medium heat for a minute or so to heat through, and then pour in cream. Reduce heat, and let simmer, while pasta is cooking.